The next district trip is to the Yukon! There are only 2 spots available for this trip, so make sure to sign up as soon as possible. Give them to me in A125. If you have any questions, please come and see me or send me an email. We will be having our next luncheon next week in the multi-purpose room. Please come to the multi-purpose room at lunch on your assigned day. The After School SUCCESS Program is back! Are you struggling in a class? Do you need some help with your homework or an exam? You can get extra help in group/peer study after school! There are several computers/tablets available for students to use. If you speak and read/write another language fluently, there is an opportunity for you to get course credit for that language. You can take the language challenge exam and, if you pass, you will get the same credit as if you took the course. This exam is only if you do not have a credit in that course already. The district is holding a post secondary fair for anyone who is interested in attending college or university in Canada. 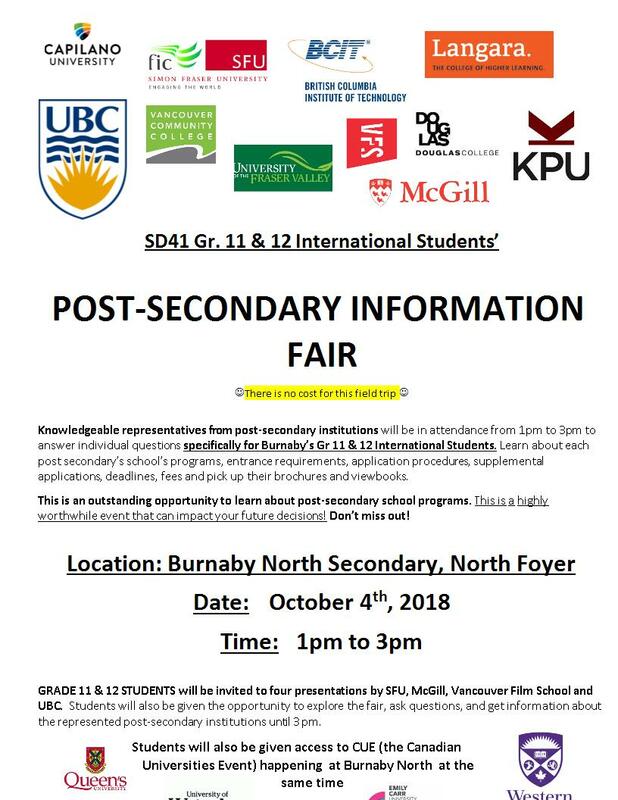 Different universities, including UBC, SFU and McGill will be there and you can get information about the application process and the programs that are available at these schools. The fair is free and takes place at Burnaby North Secondary on October 4th at 1:00pm. If you are interested, please get the attached consent form (post-sec info fair consent Oct 2018) signed and pick up a field trip form from me in A125. The deadline is Sept. 28th. If you have any questions, please come by and see me.